There are many types of biomass—organic matter such as plants, residue from agriculture and forestry, and the organic component of municipal and industrial wastes—that can now be used to produce fuels, chemicals, and power. Wood has been used to provide heat for thousands of years. This flexibility has resulted in increased use of biomass technologies. According to the Energy Information Administration, 53% of all renewable energy consumed in the United States was biomass-based in 2007. Biomass technologies break down organic matter to release stored energy from the sun. Biofuels are liquid or gaseous fuels produced from biomass. Most biofuels are used for transportation, but some are used as fuels to produce electricity. The expanded use of biofuels offers an array of benefits for our energy security, economic growth, and environment. Current biofuels research focuses on new forms of biofuels such as ethanol and biodiesel, and on biofuels conversion processes. Ethanol—an alcohol—is made primarily from the starch in corn grain. It is most commonly used as an additive to petroleum-based fuels to reduce toxic air emissions and increase octane. Today, roughly half of the gasoline sold in the United States includes 5%-10% ethanol. Biodiesel use is relatively small, but its benefits to air quality are dramatic. Biodiesel is produced through a process that combines organically-derived oils with alcohol (ethanol or methanol) in the presence of a catalyst to form ethyl or methyl ester. The biomass-derived ethyl or methyl esters can be blended with conventional diesel fuel or used as a neat fuel (100% biodiesel). Biomass resources include any plant-derived organic matter that is available on a renewable basis. These materials are commonly referred to as feedstocks. 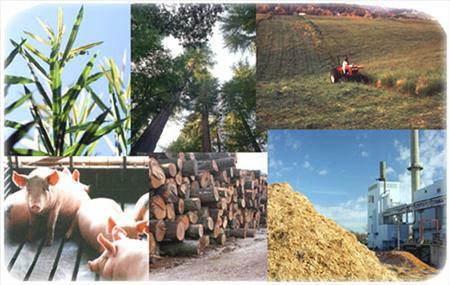 Biomass feedstocks include dedicated energy crops, agricultural crops, forestry residues, aquatic crops, biomass processing residues, municipal waste, and animal waste. Herbaceous energy crops are perennials that are harvested annually after taking 2 to 3 years to reach full productivity. These include such grasses as switchgrass, miscanthus (also known as elephant grass or e-grass), bamboo, sweet sorghum, tall fescue, kochia, wheatgrass, and others. Short-rotation woody crops are fast-growing hardwood trees that are harvested within 5 to 8 years of planting. These include hybrid poplar, hybrid willow, silver maple, eastern cottonwood, green ash, black walnut, sweetgum, and sycamore. Agricultural crops include currently available commodity products such as cornstarch and corn oil, soybean oil and meal, wheat starch, and vegetable oils. They generally yield sugars, oils, and extractives, although they can also be used to produce plastics as well as other chemicals and products. Agriculture crop residues include biomass materials, primarily stalks and leaves, that are not harvested or removed from fields in commercial use. Examples include corn stover (stalks, leaves, husks, and cobs), wheat straw, and rice straw. With approximately 80 million acres of corn planted annually, corn stover is expected to become a major feedstock for biopower applications. Forestry residues include biomass not harvested or removed from logging sites in commercial hardwood and softwood stands as well as material resulting from forest management operations such as pre-commercial thinning and removal of dead and dying trees. There are a variety of aquatic biomass resources, such as algae, giant kelp, other seaweed, and marine microflora. Biomass processing yields byproducts and waste streams that are collectively called residues and have significant energy potential. Residues are simple to use because they have already been collected. For example, the processing of wood for products or pulp produces unused sawdust, bark, branches, and leaves/needles. Residential, commercial, and institutional post-consumer waste contains a significant proportion of plant-derived organic material that constitute a renewable energy resource. Waste paper, cardboard, wood waste, and yard waste are examples of biomass resources in municipal waste. Farms and animal-processing operations create animal wastes that constitute a complex source of organic materials with environmental consequences. These wastes can be used to make many products, including energy. Some biomass feedstocks, such as municipal waste, are found throughout the United States. Others, such as energy crops, are concentrated in the eastern half of the country. As technologies develop to more efficiently process complex feedstocks, the biomass resource base will expand. Landfills can be a source of energy. 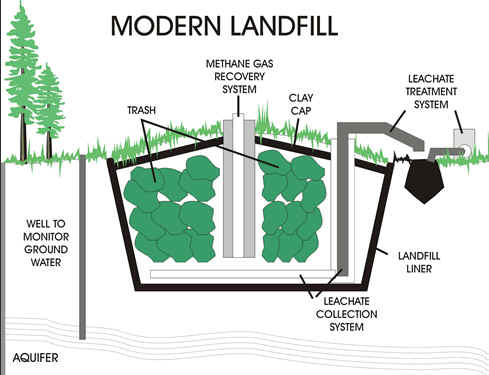 Organic waste produces a gas called methane as it decomposes, or rots. Methane is the same energy-rich gas that is in natural gas, the fuel sold by natural gas utility companies. It is colorless and odorless. Natural gas utilities add an odorant (bad smell) so people can detect seeping gas, but it can be dangerous to people or the environment. New rules require landfills to collect methane gas as a pollution and safety measure.